Over the past three beta weekends, I leveled each crafting discipline (All except huntsman over 100). I also spent a ton of time mapping zones and researching any source I could find. Here are some pointers to help you hit the ground running when the game releases. 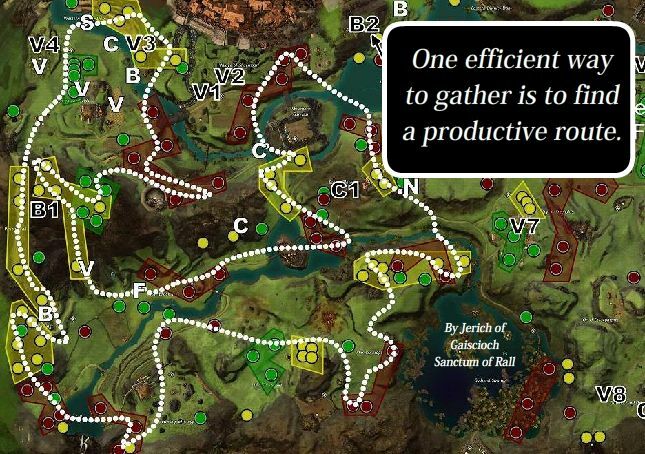 The Guild Wars 2 system is designed so that you will only learn about 1/4 to 1/3 of the total crafting recipes while leveling. If you try to learn them all, you need three to four times the ingredients (which could be better spent leveling an entirely different discipline). Experience: Every crafting profession will give you ten character levels. When you throw gathering in the mix, it is not impossible to get over 25% of your character experience just through crafting. Self Sufficiency: Even with a global trading post, there are often times you will not be able to find the exact item you want. Leveling crafting lets you tailor make your equipment to whatever stat you want without having to hope that someone put the exact item you want on the trading post for a decent price. 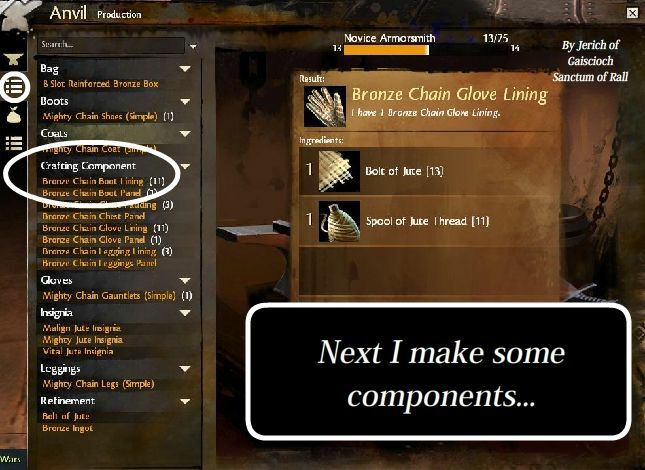 Fun: If you value discovery and making your own gear, the Guildwars 2 crafting process is easy, non-grindy and fun! Helping Others: It is fun to be able to meet other people’s needs. Epic Items: You will need to have at least two crafting disciplines maxed to make epic weapons. These are the mountaintop goals of GW 2 PvE. Profit: While it can take a lot of work to become wealthy while crafting, it is actually one of the better ways to become wealthy (if you know what you are doing). I will write a section on this later. Convenient Bank Access: You can access your bank via crafting stations. Since there are crafting stations at each major outpost, this means you will be able to access your bank on the field. 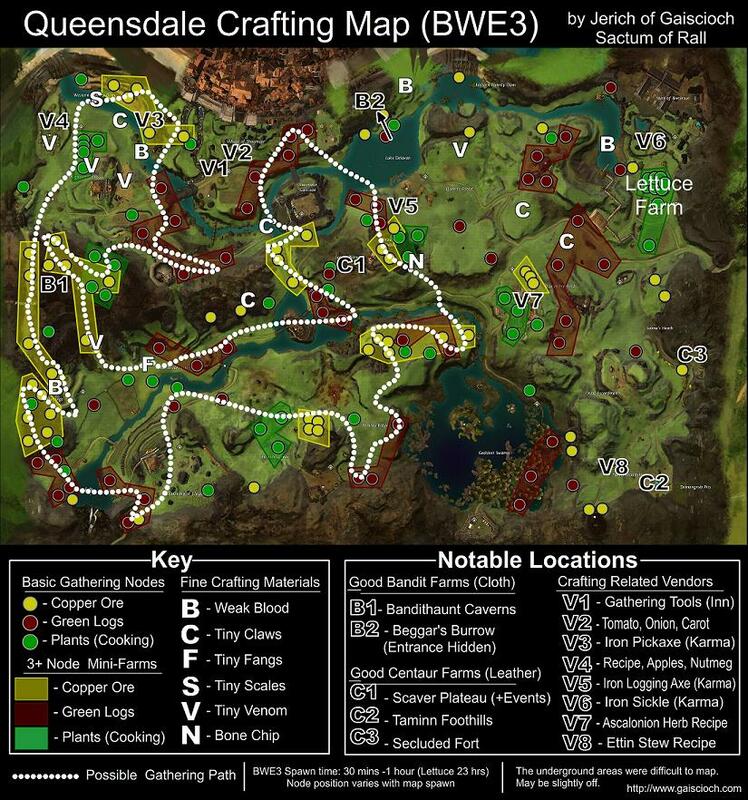 What are the Guild Wars 2 Crafting Disciplines? *In addition to specialty bags, armor crafting professions can all make normal and invisible bags. Jeweler Accessories consist of rings, earrings and necklaces. 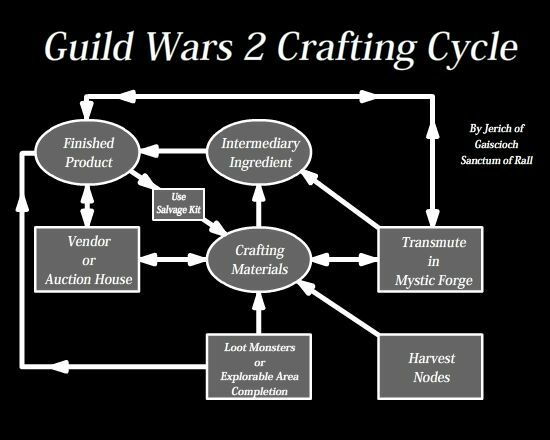 What are the steps of the Guild Wars 2 Crafting Process? How is Guild Wars 2 Crafting Different than Other MMOs? While there are similarities to existing MMOs, Guild Wars 2 definitely has some distinctives. It is Discovery Based: You are given very few recipes and have to experiment (or read a guide) to uncover new ones. This is by far the most efficient way to level and actually pretty easy if you know what you are doing. 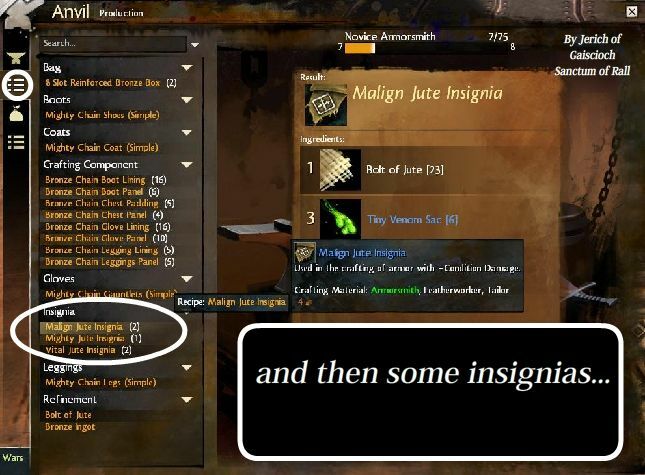 It is Anti-Grind: You do not need to make 100 widgets to level crafting in Guild Wars 2. If you are doing it right, you will only need to make one each of a specific finished product. It is Big: There are a ton of recipes to discover. Armor Smith alone has over one hundred and fifty finished products in tier one. Expect there to be well over 500 valid recipes for each profession. It has Bloat (which is a good thing): Each crafter is not meant to discover everything. Most people will make less than a quarter of the total recipes while leveling. This is by design and discovering each recipe will be a time consuming (and somewhat wasteful process). You could most likely level four to five disciplines with the resources necessary to completely explore one of them. 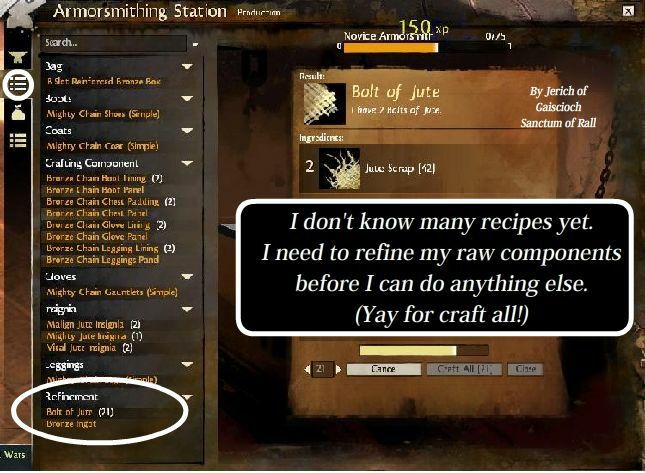 It is More Streamlined: From being able to send crafting materials directly to your bank, to being able to access your bank while crafting, to being able to discover recipes without every looking at a guide, Guild Wars 2’s crafting process is more user friendly than any game I have played. It is Not Random: While some people may debate this with me, I believe this is a good thing. Won’t a Global Trading Post Ruin the Crafting Market? You don’t need to make more than one of any item while leveling. This prevents crafted items from flooding the marketplace. You won’t discover more than a quarter to a third of the items while leveling. This means that everyone will have niche recipes that they make that other people don’t. There are a ton of recipes to make (that means that there are enough niches to satisfy a lot of people). Due to Guild Wars 2’s item scaling philosophy, crafted items won’t become obsolete with new content like they do in other MMOs. Crafted items are Bind on Equip, so people won’t be able to resell them after using them. This is not to say that it is easy to make a profit crafting (it isn’t), but many crafters have made money and have made a lot of it. I believe that these factors will enable a smart and motivated crafter to turn a profit even when faced with the competition from a global marketplace. I will go into detail on how later. You can choose two active crafting disciplines per character. While you can actually have more, doing so incurs a cost (40 silver at max level) each time you want to swap back to an inactive discipline. There are a variety of reasons to choose a particular set of crafting disciplines on your character. Here are some things you should think about before choosing. Is it Useful to Your Profession? Which disciplines work well together materials wise? As you can see, the limiting component for the six equipment making professions is Fine Crafting Materials (like a Vial of Weak Blood or a Tiny Totem). These are materials that primarily drop from monsters, they cannot be harvested. 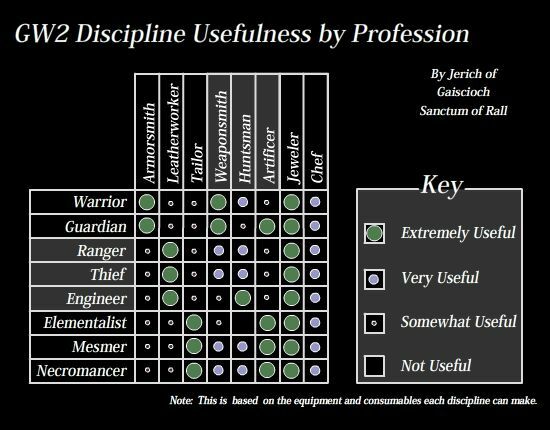 If you attempt to do more than one of these professions, you will need to either grind or buy extra Fine Crafting Materials from the Auction House. In fact, the trend has been for Arenanet to increase the ammount of fine crafting components needed. 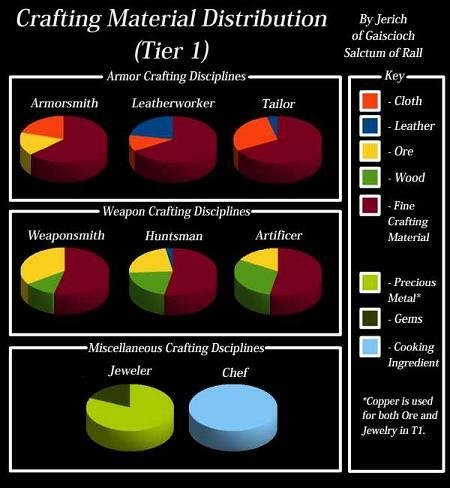 At the time I am writing this guide, the percentage of fine crafting components needed has actually increased. Armorsmith and Tailoring use the most cloth, which I find the hardest ingredient to collect in large amount. All the Weapon skills use varying amounts of wood and ore.
What conclusions can we make from this chart? In particular, Jeweler works best with any metal heavy discipline (since you get gems from metal nodes). While this is challenging for Tier 1 since they both use copper ore, they use different metals in T2 and T3 (but the same metals again in T4-T6). To a lesser extent, any weapon crafting discipline works well with any armor crafting discipline. Armor Crafter and Weaponsmith are the worst of these combinations since they both use metal. The worst combinations are two Weapon or two Armor disciplines. Certain types of playing styles yield themselves to gathering different kinds of materials. This kind of player completes every zone in order, getting every heart, exploring every zone, and basically just likes to have 100% completion on every area in the game. They will get a lot of every material and their ore ratio will depend on how far off the beaten track they go. If they just go from point to point, their material ratio will be more like the Heart Farmer. If they go off the beaten track it will be more like the Explorer. Needless to say, though, these guys will be swimming in materials and may even have enough to feed four or more disciplines on alts (unless they try to discover every recipe… that way leads to madness). Best Fit: Chef (This discipline needs access to heart vendors across a wide ranger of areas… Only a Completionist can really do it justice) Right now, however, chef is fairly easy to level and you cannot make much profit on it. Personally, however, I think it is the most fun of all disciplines. Good Fit: Everything else and perhaps 3-4 more disciplines. Your only problem will be being too high a level to use your gear… but that is what alts are for! Do you want to sell your goods on the Market? As you probably expected, Jeweler comes out way ahead since it makes goods that every class can use. 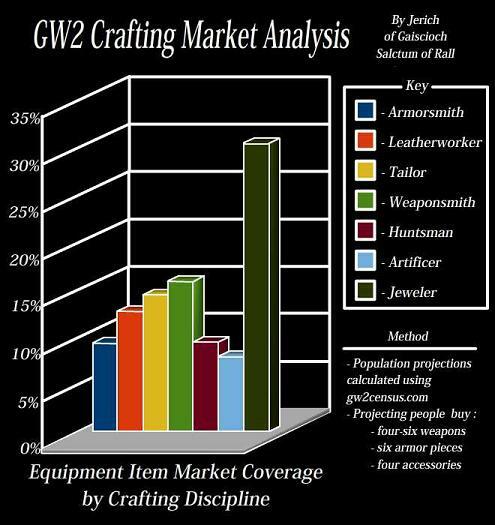 Weaponsmith makes weapons that almost every class can use so it is second. * While Artificer falls dead last, remember that both it and Chef make consumable buffs. If these become the standard for dungeon and WvWvW raids, both of these professions may turn out to be lucrative. One thing to to keep in mind while looking at this chart, however, is that it only takes into account potential demand for items. The price of items will also be dependent on supply and this will be hard to predict before the game goes live. Recently, John Smith (The Economist of GW 2) posted a blog about the beta economies here. It seems that jeweler was the most popular profession by a lot. If this trend continues, weaponcrafting professions may be the most lucrative in terms of supply and demand. Also be aware that artificer, jewelcrafting and cooking seem to be the easiest professions to level right now (because they are not as dependent on fine crafting materials). Be aware that this will affect supply. I will talk more about how to sell your goods on the Auction House for profit in part 6 of this guide. Do you want Legendary Weapons? Maxing Every Discipline – Alts or Not? Con – You have to swap characters often. If you are using alts, combine your weapon and armorsmithing disciplines on the same characters. This allows you to buy the rare and exotic karma recipes one (or two times) instead of once for each recipe. Pro – Some heart vendor recipes are soulbound. This means that you will have to explore with alternate characters to get them if you don’t craft on your main. Con – Space will get short and you will find yourself muling often. Once you have decided on your two disciplines, it is time to talk to the master crafter and learn them. Don’t worry too much about choosing wrongly. It is free to drop one of your existing disciplines and pick up a new one later. It is also fairly inexpensive to pick up a discipline you dropped. (10 copper per skill point). Lion’s arch is the way to get to other Newbie areas (you will likely want to do at least a couple). Lion’s Arch is the best place to craft in the game (crafting stations, auction house, bank and Mystic Forge are all in one convenient location). I used to do all my crafting in Divinities Reach, but honestly, Lion’s Arch is so much better than any other area that you want to make this your crafting home. The first place to begin is to go to your collections tab… If you have been gathering components and sending them to your bank, this is where they show up. In order to start crafting, you actually have to transfer all relevant materials to your inventory. Note that now might also be a good time to either craft yourself eight slot bags if you have the components, buy them off the auction house or at least buy four of the leather bags you can buy from almost any vendor. Now that you have moved your materials to your inventory, you can switch to the recipe tab and start crafting. The first thing you will need to do is refine your basic materials. You should always do these in batch as soon as you are able to make a new tier because you want to get as many levels as possible through refinement. After I have done this, it is time to make some intermediary components. If this is your first time playing, you probably won’t have enough materials to make a ton of items. You probably do have enough to make some. Hopefully you have some weak blood by now. If you do you can make some level five weapons or armor. You might also want to make yourself some bags and runes if your profession allows it. You may be tempted at this point to grind your levels on basic things like bags and simple armor. You should not do this. 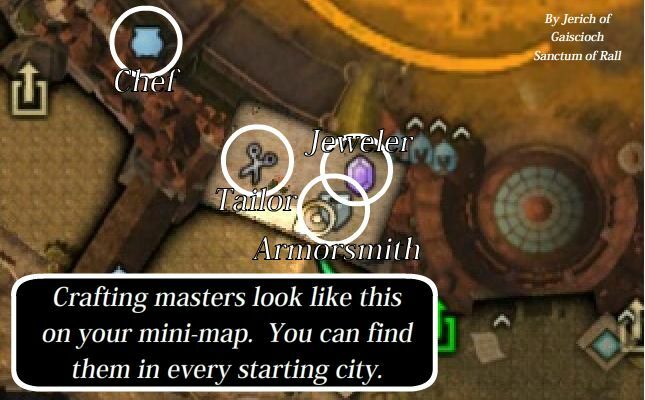 Guild Wars 2 crafting is discovery based and you level at least twice as fast using the discovery system. My next step is usually to make enough components to begin the discovery process. In the case of leveling Armorsmith, that means I will need to make some insignias. Once you have enough made components, you can switch over to the discovery tab and begin the discovery process. 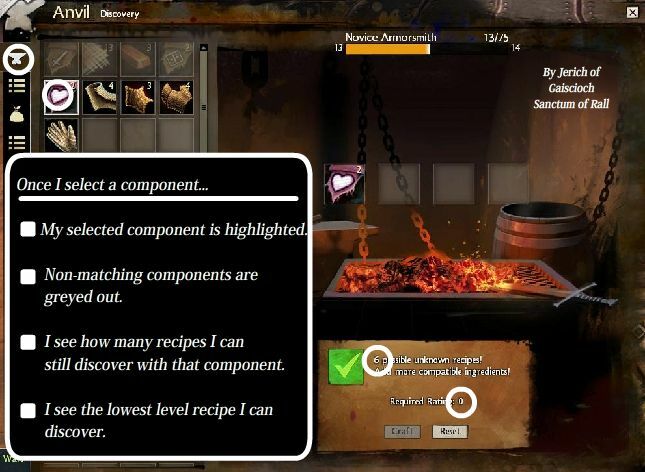 Now that you have selected at least one component, you can clearly see how many undiscovered recipes there are that use it (note that not all of these will currently be creatable at your skill level). You can also see the required skill level for the currently selected item. The nicest thing about the discovery pane, is that the items that don’t combine with the selected material will gray out (which makes finding new recipes fairly easy). Notice that all the other components are now grayed out and I have the option to craft this new recipe. When you click the button, the UI tells you what you have crafted, adds it to your recipe list and gives you the option to make more. If particular, note the large amount of bonus experience we get for discovery. In this case it is 100% but it can go as high as 150% if we get a critical success. This is the main reason you generally want to level crafting through discovery. You can level with half the materials you would use just by grinding. Next I will talk about how to efficiently level crafting. 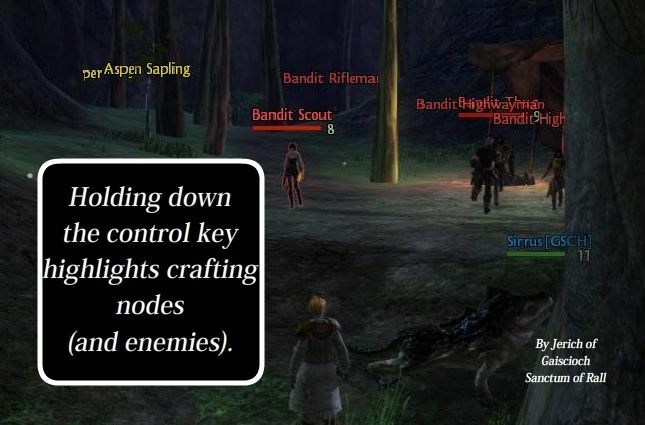 Crafting in Guild Wars 2 uses six tiered system. During the beta weekend events we have been able to get to tier three. Here is a chart that shows the tiers as of Beta Weekend 3 (I have added the tiers after tier three by searching for recipes). Now let’s more closely example a tier in detail. In Sub-Tier 3: We will discover masterwork armor. Since masterwork armor takes a lot of fine crafting components to make, this is the most difficult sub-tier to skill through. Once you get to skill level 75 you repeat the process, but this time with Tier 2 components. Here are some general tips that apply the above information to level as efficiently as possible…. Tip #1: Make your refinements and components as soon as they become available. Refinements and components only give experience for twenty five levels. You will want to front-load them as much as possible because doing so will extract the maximum experience before they go gray. I always start by doing batch refinement of everything I have collected so far and then make enough components for my discovery process. Read section D for an example of how to do this in practice. Tip #2: Discovery is almost always better than grinding. You may be tempted to keep leveling a Sub-Tier 1 level item once you hit level 25 because they will still yield experience. Resist the urge. Why? You will level much faster and more efficiently using the Sub-Tier 2 armor that just opened up. This will mean you will have more available fine crafting components for Sub-Tier 3. Since this is the hardest Sub-Tier to get through, you will need to save as many components as possible. Tip #4: Be adaptable in your level strategy. Have you been finding a ton of a specific component? Go ahead and discover one of each type of item that component can make. Are you finding an even amount of components? Cherry pick the recipes that use the least amount of materials and make one type of each of those. You should be constantly evaluating what you have available and use the appropriate materials. The main thing to watch out for is the second set of 25 points. Don’t violate Tip #3 if you can help it. Tip #5: Don’t be afraid to use the trading post. You can get a lot of discovery points making things like runes and sigils if you buy the rare components on the trading post. Always be searching for cheap fine crafting materials and rare components. Sell you excess materials and buy these cheaply. You will level a lot faster if you do. 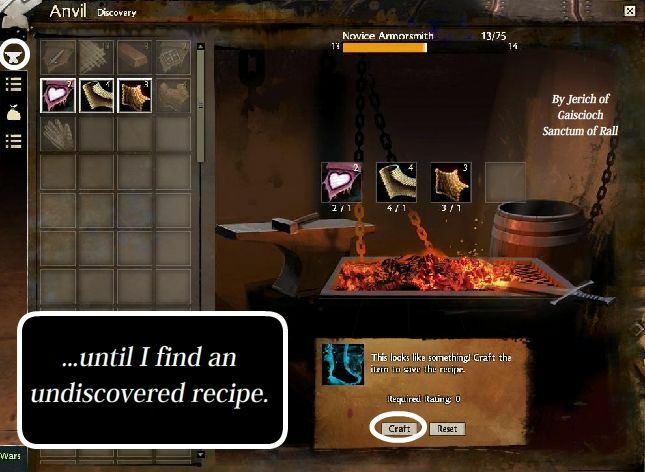 While most of the general recipes are predictable, you will often miss easy experience like runes and bag discoveries. You should bookmark sites like http://wiki.guildwars2.com/ and http://www.gw2db.com/ and get used to using them. I use Guildwars 2 wiki to get a general understanding of what is available to craft and gw2db for its sorting potential. In particular gw2db.com can sort according to crafting discipline and skill level. This lets you see at a glance what you can craft. You don’t need to worry about being as efficient as possible. As long as you are not completely inefficient you should be able to level quickly and easily. Just making gear you are going to use will almost take you through a tier. The bellow example illustrates this point. Let’s say I am making a new warrior and I want to create my own gear and bags while leveling. I don’t have access to the resources of another character so I won’t be able to do things like frontload the first 20 points of each tier with refinements and components. Here is what I can expect assuming I am really unlucky and don’t get any critical successes (You will actually level slightly faster than this example). During these early levels, I will mine ore, farm jute and some blood. Once I get to level 5 it is time to make some armor and runes to wear! Discover a rune of life: (Current Skill Level 17). I continue to mine ore, farm jute, etc. I am also going to try to get twelve bone chips so I can make myself some vital armor. Once I have the materials, I will make myself two eight slot boxes and some level 10 armor. Continue to farm ingredients and level. I am going for a defensive character with my warrior so I decide I want toughness this time and make sure I either farm fifteen tiny scales or get them from the auction house. I also need four crystal and molten slivers to make runes for my level fifteen armor. I am also going to want three tiny scales and three glittering dust to make my last two 8-slot bags. I am continuing to level and farm Tier 1 materials. Note that I will start finding tier two materials somewhere in this level range. In keeping with my defensive theme, I’m going to make some masterwork resilient armor and keep the same rune combination as last time (with one rune of Svanir thrown in the mix). Make my masterwork resilient armor: (Skill Level 70). Note that at this point, I am probably only one four discoveries away from Skill Level 75 and Tier 2 (depending on how lucky I have been with my discoveries). That should be pretty easy at this point. I don’t typically plan out my leveling path in this much detail, but I wanted to show you how easy it is to get from one tier to the other even if you are not 100% efficient. You can practically do it just making items that you are going to personally use. While it is possible to level a bit more efficiently that my warrior did in this example, you can still level crafting while you level up your character and keep yourself geared at the same time. 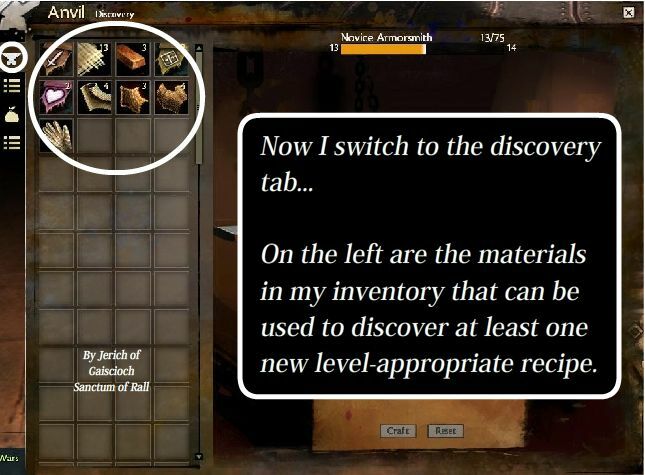 People at Guild Wars 2 Wiki have already figured out how the experience formula for crafting works. I am going to get a little mathy here… so if you don’t like math, feel free to skip to the conclusions summary after the next chart. The first crafting level requires 500 experience. Each level beyond that requires 1% more than the last. The important thing to note here is that the xp gain equation takes the requirement for the next level into consideration. This means the leveling curve is flat and the percentage of experience you get towards your next level is only dependent on the item type you are making and how much you exceed that items minimum level requirement. Refinements and components only give experience for 25 crafting levels beyond the minimum. Gear / Food gives experience for 40 levels beyond the minimum. 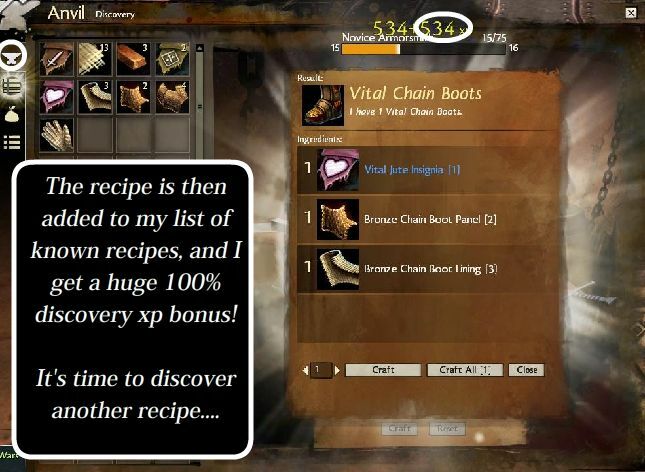 Discovering a recipe at the level it opens can yield almost 3 crafting levels of experience! Gear / Food and Discoveries will give you the Bulk of your experience. Tip #1: Offer to Make Gear for your Guildies/Friends! Most likely, you are leveling slightly slower than the powerhouses of your guild that are not going for multi-zone completion. Offer to convert their raw materials into gear for them. You get levels and they get gear. Everyone wins! Tip #2: Use the Mystic Forge! Even if you don’t have any friends, you should at least make friends with Zommoros. He is always willing to help you out… for a price. 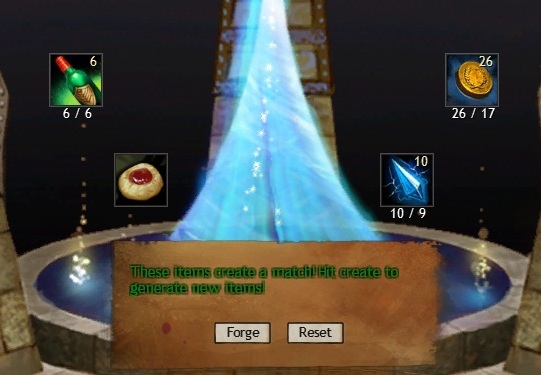 :) You can actually covert one tier of ingredients to the next using the Mystic Forge. I will go into this more in the next section. If you are doing multiple full clears of zones, you are most likely swimming in Tier 1 components and skill points. You can use those extra ingredients to start you on your Tier 2 journey so you don’t miss out on the fun of self-crafted gear. Tip #3: Use the Trading Post! Sell some of your excess ingredients and buy tier two ones. While this is usually more expensive than the Mystic Forge, you should be able to get some great deals if you look for them. Some components make gear that not a lot of people want and these tend to go for cheap. 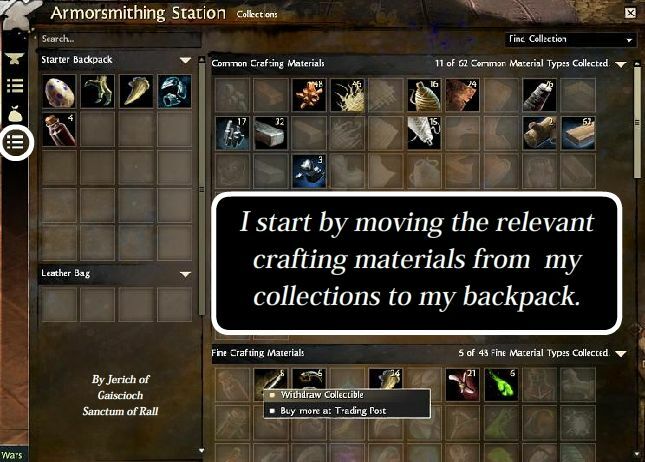 The most important thing you should know about gathering in Guild Wars 2 is how to manage your inventory. Typically crafters always have a ridiculously hard time managing their bulging packs in MMOs. Guild Wars 2 helps in this regard by giving you the option to send your materials directly to your bank while on the field. The first (easy to miss because you have to pick the dropdown on the top of your inventory) is to send all the collectables in your inventory directly to your bank. The second is to right click on each collectable one at a time and send it to your bank. First, your faithful mini-pets are not safe! Unfortunately, mini-pets count as a collectable. This means that the send all feature will boot them directly to your bank. There are three solutions to this problem. One is to have a copy of your minature already in the bank collections. This will prevent your inventory one from being sent. The second is to get tailor made craftman’s bag. Materials will be placed here first and therefore be easy to right click one at a time and send to your bank. Move the material from your collections tab to your bank proper. 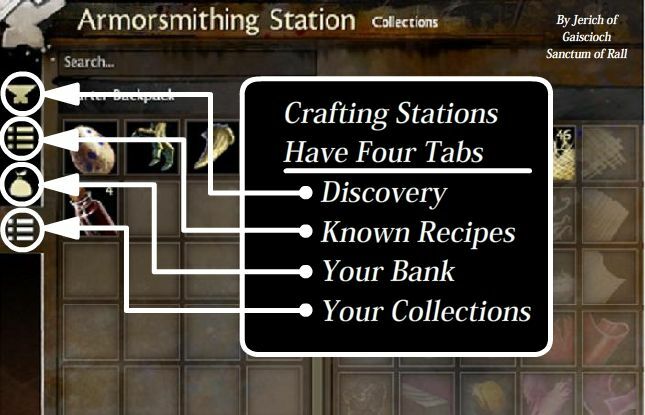 If you are a crafter, you will be able to access your bank at the workstations at every major crafting station. You can mail the excess to a secondary account or friend and have them return the mail to you. Now would be a perfect time to visit the Mystic Forge and transmute the component to the next tier! 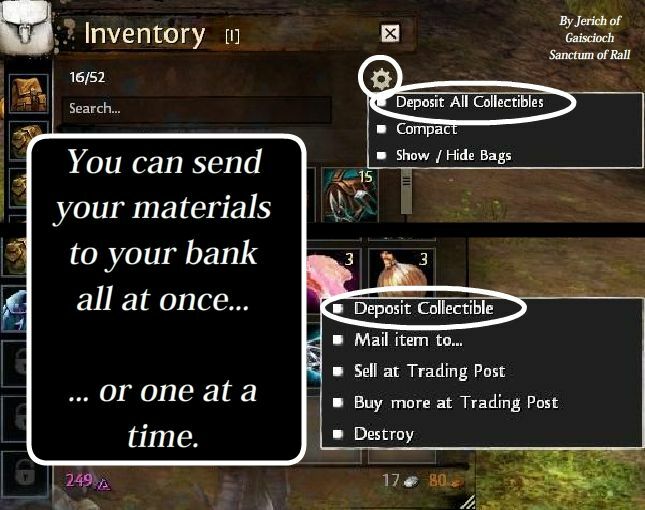 As soon as the collections area is no longer jammed, you can start sending the material to your bank again. If you have played other MMOs, you are familiar with having to share harvesting nodes or being annoyed when a group member runs off to harvest. GW 2 is not like that. Everyone in your party can see the node and every one can harvest it. The node refresh timer is personal. You also get a TON of experience for harvesting (about three monster kills worth) and nodes can drop rare items like gems and dyes. This means a couple things. You should always have the appropriate harvesting tools at hand and harvest most nodes you run across. 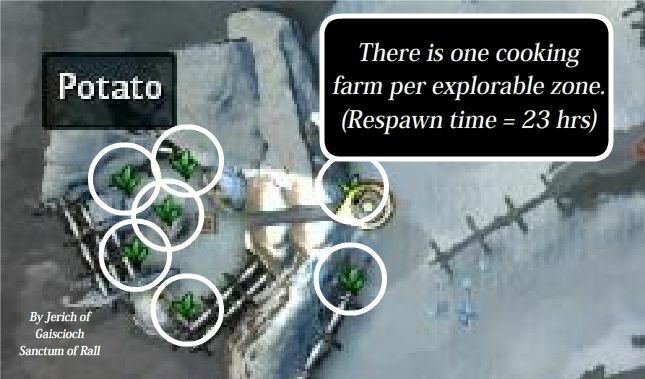 If you are grouped, you should make harvesting part of you scheme and all harvest every node you run across. The first thing I do after making a new character is do one or two hearts. As soon as I do this, I have enough money for a set of basic gathering tools. While there are multiple kinds of gathering tools, you only need a set of the copper ones to harvest newbie zones. There are three types of gathering tools. Each gathering tool has a limited number of uses (30 nodes worth in the case of picks and axes, 50 nodes worth in the case of sickles). I typically carry a spare of each type with me in case my tool breaks on the field. There are multiple grades of picks ranging from copper to orichalcum. Basically each new level of pick gathers a new tier of component. You can equip them by right clicking on them. There is NO benefit to using a higher tier tool gathering tool on a lower tier item. Don’t waste them. In Queensdale – Horatio in the Shaemoor pub sales them. One of the first NPCs in every major starting city sells them. If you can’t find one on the field, zone into your city and you should have no trouble. At least one vendor in every major outpost sells them. This is a great place to restock (I typically have a spare set at all times in case my tools break). Often karma heart vendors will sell gathering tools. This is a great way to get them if you are low on cash. Supposedly each zone has one, these are the only places to get the specific cooking ingredients, and they are on a 23 hour timer. Basically they are timed to give you the incentive to log in and farm them each day without feeling like you have to camp them. 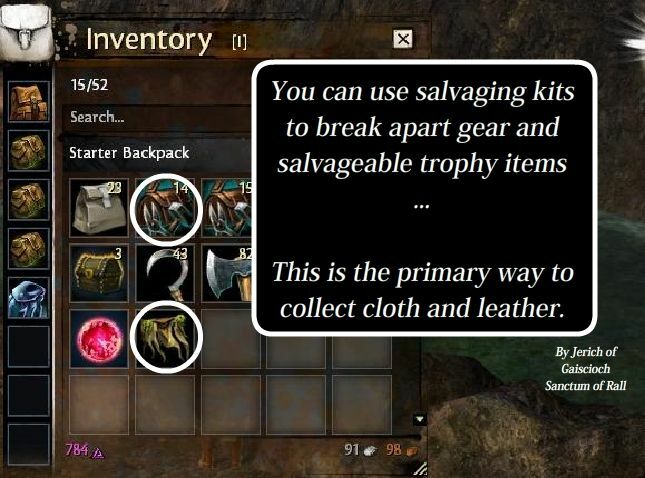 While you can gather ore, wood and plants from harvesting nodes, the primary method of collecting leather and cloth is to use salvaging kits. There are two main types of drops that can be salvaged: scraps of cloth etc that are specifically designed to be salvaged and equipment that can be salvaged (but you might also want to use it or sell it). Typically I salvage everything because there is an achievement for it and I love to get as many materials as possible, but a good case could be made for selling equipment to get money. I will leave the balance up to you. Salvage kits range from Crude (the cheapest) to Master’s (the most expensive). Like harvesting tools, salvage kits have a limited number of charges (15, 20, 25, etc). Most likely, there will eventually there will be kits with 100 or more charges, but they haven’t been added yet. While all salvage kits will give you basic components, higher quality kits have a chance of salvaging rare materials (used to make runes and sigils) and upgrade components. I suggest using crude if you are poor and at least basic or fine if you have some extra cash. 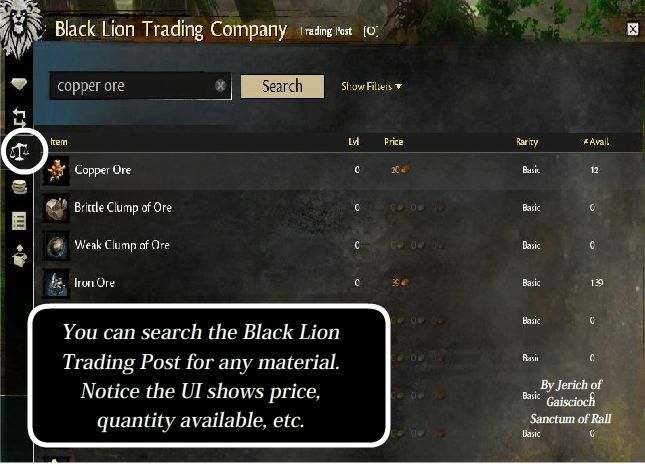 You can also buy a Black Lion Salvage Kit (25 uses) from the gem store that will always recover an upgrade component. Use this to recover those rare runes that you had to do 10 dungeon runs to get. If you don’t want to pay real money for this, you can always buy the gems from other players. Note that you can also combine the top three salvage kits with mystic forge stones to create a 250 use mystic salvage kit. This is incredibly useful and I reccomend doing this while gems are so cheap. Typically you can buy them wherever you can buy your harvesting tools. That means the first few vendors in every major city and every major outpost. Make sure you don’t run out! Heart vendors often sell salvage kits for a small amount of Karma. This is how I typically get my kits at first. Bags that humanoids drop have a chance of dropping them as well. This is a great way to stock up if you are a cheapskate (like me!). You will often need to buy crafting components from vendors before you can complete your finished goods. These range from someone standing next to the crafting station to a specific heart vendor you need to unlock. Master Craftsman: These are the people that trained you in your discipline. They sell items you need to either refine your raw materials or make your components. They also sell rare insignia patterns for karma. If you are interested in making your own gear or selling gear on the market, these are the recipes to focus on! 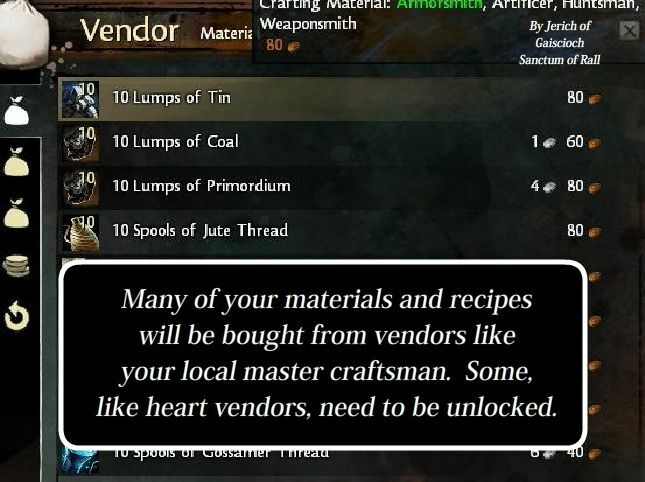 Unlockable Heart Vendors: Heart vendors often sell specific crafting recipes. You have to unlock them to access it. Also, in the case of cooking, they sell ingredients you can’t get any other way. 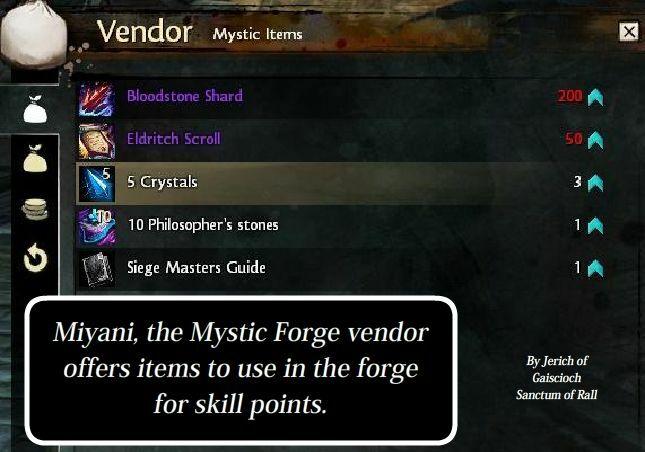 Miyani in Lion’s Arch: This Mystic Forge vendor sells items for skill points. 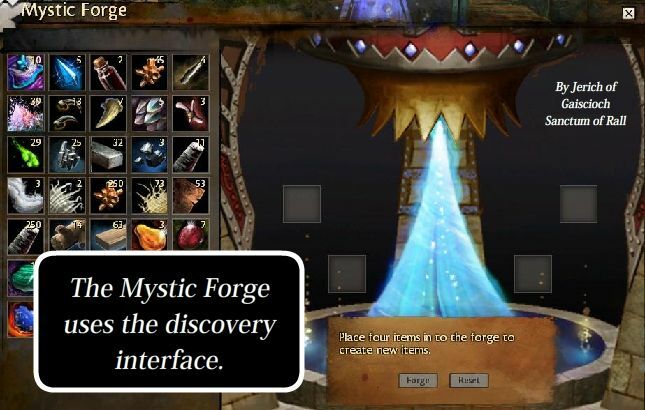 Read the advanced section for a little information on the Mystic Forge. Scattered Vendors: Other vendors are scattered throughout the land. Honestly, we don’t have much information on them yet. Be sure to explore and record your findings! NOTE: If you haven’t turned on autoloot in the options tab… do this now. You will hate life if you try to farm one of these without that. 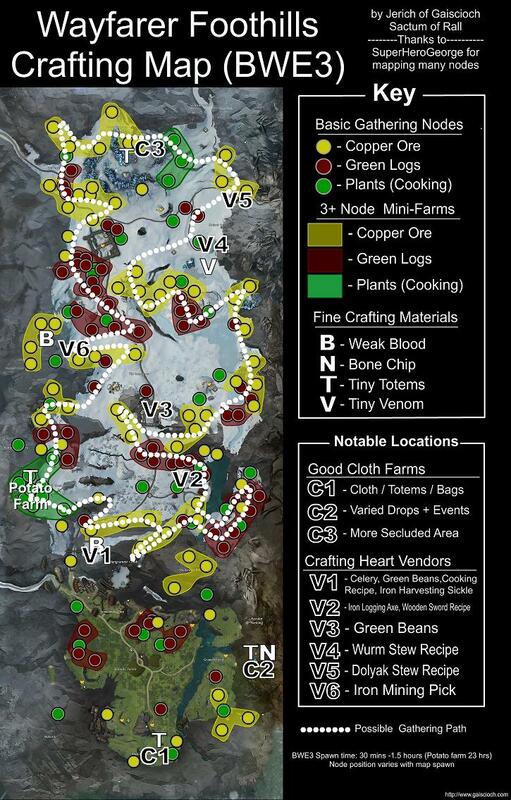 Scattered throughout each map, there are locations that tend to drop a high percentage of crafting components (either fine crafting materials or cloth or leather). Humanoid creatures are typically the best because they drop gear, cloth and leather fragments and bags filled with crafting components. The best places are usually tucked away in hidden locations which have a fast enough respawn to keep even a group occupied. One such example is Beggar’s Burrow in Queensdale. You reach it by means of a hidden door covered by shrubbery. Inside is a bandit farm where the monsters spawn faster than you can kill them and drop a ton of bags. In just 45 minutes this farmed during this last stress test I was able to come away with 55 jute cloth, 15 leather squares and 30 fine crafting components. This is typically much faster than just questing as normal will yield. When grouped, those numbers can rise to over 100 jute an hour. If you need leather, on the other hand, there are a variety of Centaur Farms in Queensdale that drop at a fairly fast rate. I recommend being on the lookout for areas like this in your travels. Note: The anti-farming code in the game will make it so you stop getting drops from monsters after about an hour. If you find this happening, it is time to move to a new area. Sometimes the nodes are not always in the same spots, but each time I have run this route, I end with over 100 copper, 75 wood and 9-11 gems. That is not bad for something that can be run by a speed specced warrior in less than thirty minutes. Unfortunately, as of the last stress test I was running into node respawn times of over an hour. While some nodes respawned quicker than this, any closed loop you want to run multiple times will have to span an entire zone to be profitable. I recommend finding a couple favorite paths, running them then doing something else for a while before running them again. Another solution would be to farm humanoids for a hour (to get the bags with gathering tools), then use those to run your route. Rinse… repeat. As soon as you do this, you will most likely see them Gem Store highlighted. You actually want the third tab down that looks like a set of scales. This is where you can search for an item or pick a common one. This is where you want to start playing the market… You could either buy the item from the lowest priced seller immediately or you can set a buy order. That allows you to name your price and hope someone will eventually sell it to you. Typically if you set a reasonable price that is near the top of the buy orders, someone will eventually come along and sell you the item (unless it is rising in price). You should always get in the habit of using buy orders to get materials you need for cheaper. Plan ahead! As a side note… you can buy or sell from anywhere, but you have to go to a trading merchant to pick up your wares. This is another reason I love to craft in Lion’s Arch. Part Six of this guide will outline more tips and tricks to using the Trading Post. In the mean-time SuperHeroGeorge is writing a great general purpose guide on the trading post. You can read it here. Each time you completely finish an explorable map (unlock all the hearts, vistas, waypoints and point of interests), you will get a variety of rewards which will include crafting components appropriate to the Zone’s level. 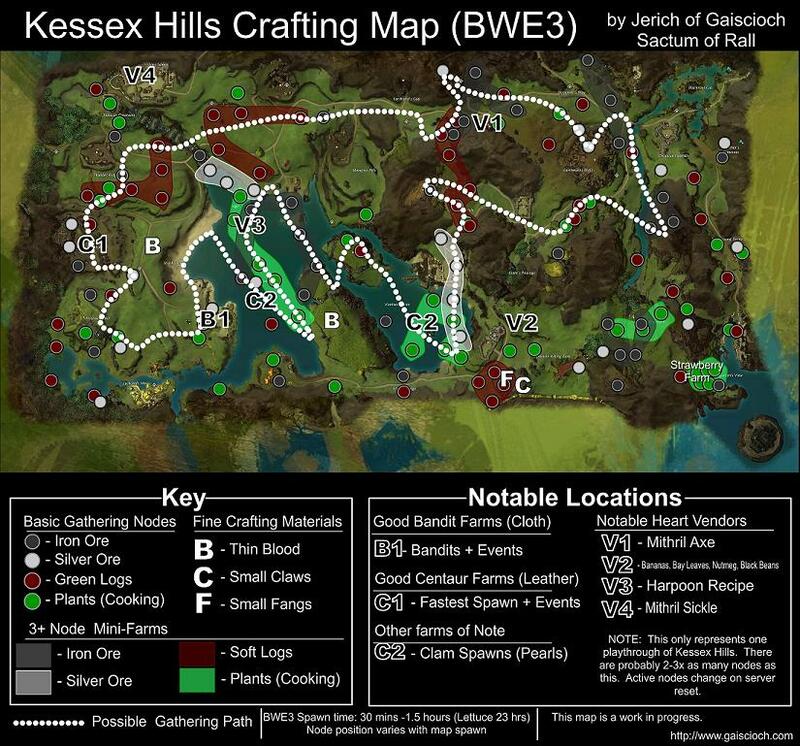 I was able to complete Queensdale and Kessex Hills during Beta Weekend 3. Each time, I got 40 of a specific component (copper ore and thin leather respectively). 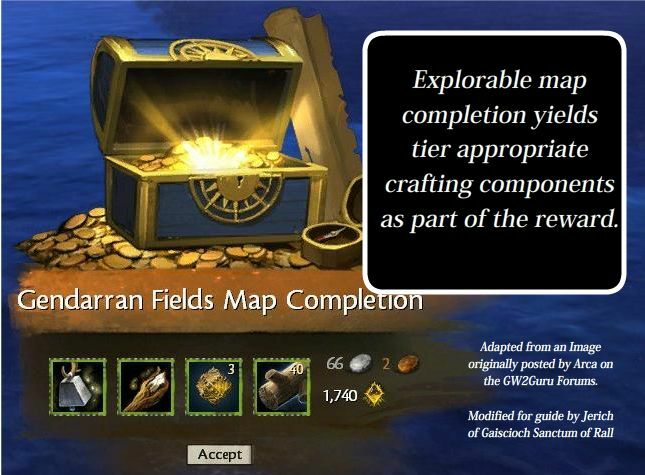 While completionists will probably get a lot of materials just exploring the map… this reward is a good bonus. One of the reasons I love Lion’s Arch is that there is a Black Lion Headquarters right by the crafting stations where I can pick up my Trading Post sales and purchases. The other reason is that it is the home of the Mystic Forge which has unique opportunities for crafting. Search for it located near the main traders plaza and it will be fairly obvious… it is a big glowing forge with a column of light above it. If you run around it you will see a vendor named Miyani. She sells items which are designed to be used in forge recipes for skill points. She also sells recipes that you need in order to make Epic Weapons. While many of these items are useful for crafting, outlining the intricate workings of the Mystic Forge could fit inside an entirely new guide. I am just going to focus on a couple recipes that will be immediately useful to the burgeoning crafter. The cheapest item is the Philospher’s Stone. You can get 10 of these for one skill point. While skill points may be in limited quantities as you level, you will keep getting them after level 80 each time you get enough experience to level. These will add up and you will use them like currency (you actually need a 200 skill point bloodstone shard to make an Epic Weapon)! As soon as you open up the Mystic Forge you should be immediately comfortable. It uses almost exactly the same interface as the discovery tab. I put some copper ore into the forge and follow that up with a Philospher’s stone. I then throw in some iron ore and some shimmering dust and hit combine…. My 250 copper has been transformed into 153 Iron Ore (which my character found much more useful). 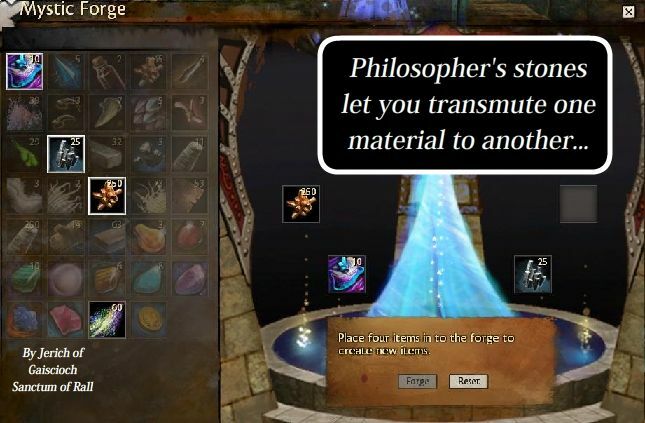 In fact, the research on Guild Wars 2 Wiki seems to indicate that any T1 material + T2 Dust + T2 material + Philospher’s stones will yield the appropriate T2 item. The recipe also works for T2-T3! While the forge research is still ongoing, this simple recipe is definitely something to keep in mind. Since I plan on completing every zone, chances are I will have more skill points and low end ingredients than I need. The forge will let me keep myself in level appropriate gear. Basically the recipe for each of these is…. I watched the servers be brought down multiple times in a row one stress test. Each time they reloaded different nodes were activated. There were about 2-3 times the total number of nodes than were activated at one time. When I run a route and come back later, the same nodes seem to have respawned. Some nodes seem to respawn quickly (15-20 minutes), others seem to take longer than an hour. (or 23 hours in the case of cooking timers). I think nodes are chosen randomly from a possible pool of nodes every time the server resets (which will probably be for maintenance). These nodes are then frozen in place until the server resets. Different nodes have different base respawn times… whether this has an element of randomness is unknown at this time. When you harvest a node, the it starts a countdown for you. Once it reaches zero you will be able to harvest the nodes again. Please let me know in this thread if you can disprove part of this theory or have some more light to shed on this. You may have jumped straight here… Be aware that node positions change every time the server resets (I am pretty sure that they are drawn from a pool of 2-3 times the total spawned nodes). That means that your nodes may be different since these maps only represent my (or in the case of wayfarer my and SuperHeroGeorges) playthroughs. That being said, there will still be prime routes due to hotspots remaining consistant (nodes are based on probability after all). If I can get people to help me with the raw data in release, I could make maps that incorporate several server resets and are more accurate. Thanks! Jerich. This is not a trading post guide. That would require entirely new guide and would be quite speculative at the moment. Note that this section is somewhat rushed because I want to get it out before launch. I will come back to it later once the market patterns start to solidify. Here are some initial observations. You don’t put up items to bid on. You put up Buy Orders and Sell Orders. 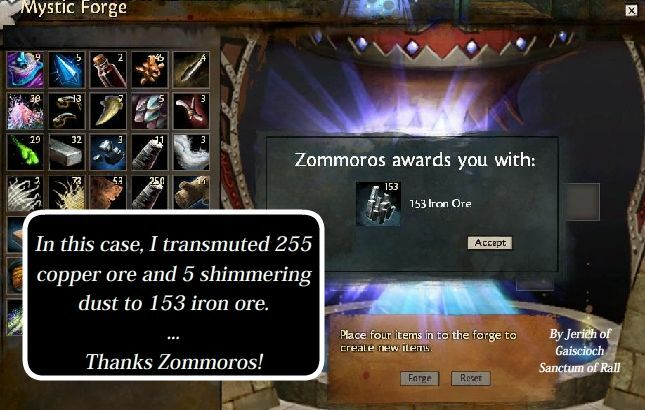 The Guild Wars 2 Trading System functions more like a commodity market that most current MMO games people play. Guild Wars 2 Wiki states that the Listing Fee is 5% of listing price. This 5% will be charged whether the item sells or not and even if you take the item off the market. If your item sells, you will be charged an additional 10% fee. I don’t think we know the impact of this right now, but it will make mass buying and selling much riskier and discourage posting inflated prices in the hope of getting lucky. You can look at buying and selling stats when trading as well as see what is buying / selling several levels deep. It is definitely worth spending some time with the interface and playing with all the options. 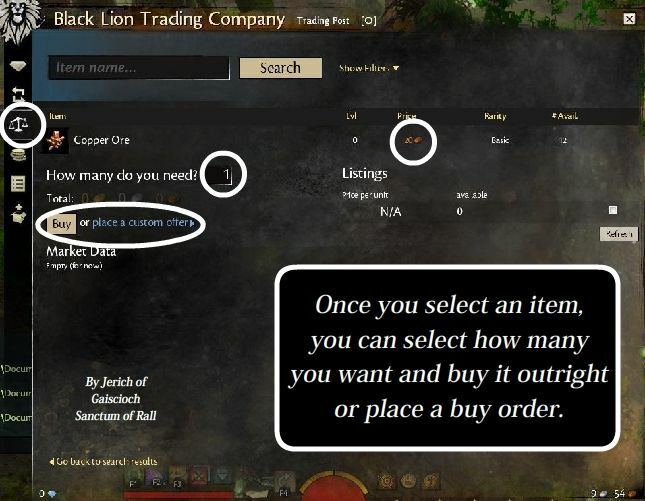 Make a goal of at least buying and selling one item your first few hours of playing GW 2. Once you are through this initial hurdle, you will start being more comfortable with the Trading Post. When to place an item up for sale: Remember that there is a 5% listing fee. If you think you are setting a reasonable price and the item will sell, then post it up. If you think the price is rising, you can even post above the current high price. When to sell to a buyer: If you think the price is falling or you need the money right now, you should sell immediately to the highest buyer. When to buy from a seller: If you need the item right now, the price seems reasonable or you think the price may be going up, then buy from a seller. When to place a buy order: If you can afford to wait, then place a buy order. If you think the price is going down, then you can place your buy order lower than the current top. Materials will be hot commodities in the beginning of the game as people use them to level. Early components will continue to retain value as the game progresses due to being able to upgrade them in the Mystic Forge. Selling materials will almost certainly be the easiest way to make money in the trading post with the least amount of effort and risk. While we don’t know which will be worth the most yet (that will be determined by demand), there are several observations we can make. In the last three Beta Weekends, materials actually dropped in price for about six hours as people explored the game and hadn’t switched to crafting mode. After that it shot up almost 100%. Wood tends to be the least profitable item with cloth the highest. In other games, once prices stabilize, they tend to minimize on Monday / Tuesday and maximize on Friday Saturday. This means that you should buy early week and sell on weekends. Note: Everything here is a Prediction. Real prices will eventually be based on supply and demand that is caused by many factors including, but not limited to frequency of drops, ease of getting rare / exotic gear without using crafting, difficulty of content, etc. These factors will drastically alter the market and cannot be fully predicted at this time. You can make rare items for the 35, 50, 65 and 80 level (and exotic items for level 80). While these items cost more to make than their masterwork equivalents, They are not worth more than twice as much. I believe people will typically want rare gear. That also means that masterwork, rare and exotic items that fall between these levels may be valuable. Explorable Dungeon Modes open up at level 35, 45, 55, 65, 75, and 80. Since people typically want to gear up for successful dungeon runs, I anticipate these levels to be where people often stop and re-gear. People tend to upgrade weapons more often than armor if money is tight. This is because weapons make a bigger impact on their killing power. Typically, max level gear and low level gear sells the best. This is because people tend to spend most of their time at max level and often get tired of a new character at low level. Rare skins that require dungeon components to make or any tradable item that is flashy and requires significant effort (skill points, dungeon tokens, many ectoplasms, etc) should be worth a lot. I predict wealthy people to buy boxes of leveling gear if we can get them in rare form. These are easier to store while your character is leveling. There will typically be one to a few types of food items that people find most useful. One will be the most common type of ground spawn food item that people use in WvWvW or dungeons, the other will be items for specific builds. Once players learn these, they will be the most common items to sell. In addition to this, items that help with leveling (+ experience etc) should sell (Once Anet fixes them). Like materials, expect prices to minimize mid week and maximize on weekends. Be aware that a five percent listing fee is a siginificant hurdle to buying components and selling gear. You need to be in a market with a large enough margin to warrant the risk of your item not selling. If you are serious, here is a technique you can employ to sell on the market. First you will want to find a corner of the market and use a spreadsheet or some other tool to calculate the rare material price of each item you want to sell based on the cost of the materials on the AH. If there are items for less than this cost * 1.25, then the item is not worth selling. If items are selling for more than this on the market (or it is empty), then sell another for 1.5 times the materials cost. Keep track of how fast the two items sell. If the first fails to sell, do not enter the market at this time. If the first sells, it may be worth selling that item if it sells consistently. If the second sells, that market is hot and you should make an effort to keep at least three items (one for 1.25, one for 1.5 and one for 1.75) on the market place each week until the market dries out. If you can spot an event trend you can make a lot of money quickly. For instance, if there is a new Wintersday event in a particular dungeon, potions appropriate to the dungeon will rise in price. If you start thinking about what people will need, you can usually find the best market. That is all I am going to write on this subject for now. I will write more once we know more about how the economy is actually working. 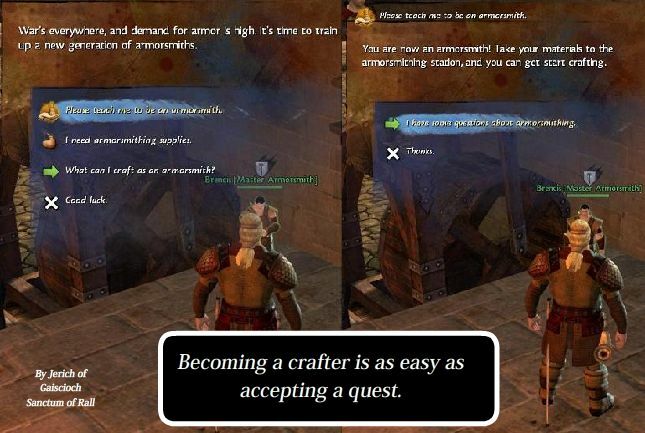 This section is designed to highlight a few tips and tricks that will be useful for crafting. Let me know if you have any other ones that you think are worth putting here! Get an invisible bag if you want to use minis. Otherwise the send all materials to bank sends the minis back too. If you have a padded equipment box to gather dropped equipment, that will make salvaging faster. Playing a class with good run speed buffs and charges will help you gather much faster. I am starting with warrior over guardian for this reason. Turn on auto=loot in the beginning of the game. This will save you a ton of time and won’t be a big deal inventory wise if you are careful. Always sell junk items whenever you can. Try to keep your bank clear so you can send items back to it. This can sometimes be a pain, but it will save you grief in the long haul. Hold down control to highlight crafting nodes. This will help you find hidden ones. You should convince your entire group to gather while grouped. It is better for experience and will keep them from being annoyed at you when you sometimes run off. I recommend using Lion’s Arch as your crafting hub. It is superior to all other zones. You should make use of crafting stations while on the field to craft upgrade your inventory / fix your bank. It is incredibly useful. You may want to find a crafting buddy that is doing other disciplines than you and send each other excess components. You can then make each other gear (this will give you more purpose to your discoveries). You will often be able to sell your finished gear on the trading post for more than the vendor sale price. I typically do this (or salvage them). If you are a member of Gaiscioch, make sure to check out Marketplace. It is a great way to get resources for leveling crafting and then use them to help out guild members. You will also gain contribution points and artisan points by using this. Have any other tips you think would be useful for people? Feel free to contribute them and I will update them. Check the botton of this guide for information on how to contribute. Note: This guide is not meant to take the place of specific discipline guides. I do, however want to give you enough information to get you started so you don’t miss entire categories of recipes. It is meant to be used in tandem with another resource like Guild Wars 2 Wiki, gwdb, or Guildhead. Here are some general tips / general recipes for each discipline. If you are having trouble getting from 0-25 and you want something to grind on… Runes of Life are the cheapest. You can buy Rare Insignias with Karma from your Master Trainer. There are ones for level 35, 50, 65 and 80. Iron Legion’s Armor: Purchasable in Char Areas for Karma? Masks, Shoulders, and Gloves and Boots are the best things to make while leveling since they are cheaper than Leggings and Chest. I haven’t found any yet. Let me know if you find them. Masks, Gloves, Shoulders, and Boots are the best things to make while leveling since they are cheaper than Leggings and Chest. Often potions will be the cheapest thing to skill up on. If you can get a lot of potion components, you may want to break the discovery rule while leveling… And example would be a Minor Potion of Nightmare Court Slaying which is a level 100 item that requires lettuce, spinach, venom and water. If you farm spinach farms for a couple days, this will most likely be an easy few levels. Level 25-50 is a dead-zone where you only have six recipes to discover. You may need to grind extra items in this area. Luckily you will have necklaces and four gems (eight recipes) in T2. If you plan on discovering each recipe, plan on getting a lot of bag space. Cooking can be the most bag intensive. If you play your cards right, however, you can look for recipes that are easy to make that you can grind on. One example is Chocolate Covered Bananas. These only require chocolate bars (which can be bought from your trainer) and Bananas (which can be bought for karma). A large stack of the same item, will often be more useful for leveling (since a single stack of 20 items takes up less space than 20 stacks of one while on the field). Keep that in mind while grinding. One way of leveling cooking is to grinding on recipes that you will use. The wiki says that cooking recipes do not stack. I was, however, able to get two to stack while eating in beta weekend 3. I am not sure if that was a bug or not. I will try to make another guide for cooking later. (unless one I can link to gets made first). Covering karma vendors etc… here would give this guide too much bloat. 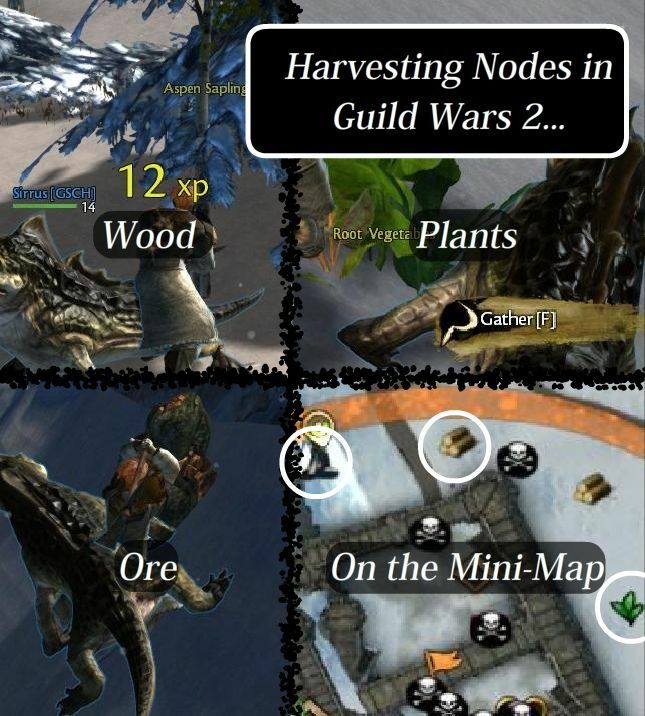 http://wiki.guildwars2.com/wiki/ – This is a one stop shop for most things Guild Wars 2. The Guild Wars community is great at keeping wikis up to date. The crafting section is great and will often link directly to zone information. http://www.gw2db.com/ – The curse database site. You can sort by level of crafting skill which is incredibly useful. http://www.guildhead.com/ – Made by the creators of Wowhead. This will most likely be a great tool with interactive maps as well as item searches. https://forum-en.guildwars2.com/forum – The official forums. http://www.reddit.com/r/Guildwars2/ – Not Actually a forum, but the Guild Wars 2 sub-redit is a great place to frequently scan to see if you have missed something important. I will link these as they become available. Let me know of any high quality discipline guides are written. If you find any more links that you think I should post here, let me know either here or my guru link (which is stickied in the guru forums). I will look at them and add them if they look useful.